On Wednesday Cookery Club were lucky enough to be joined by Mrs Wade and Mrs Maurice from Vanilla Cake Design (www.vanillacakedesign.com). They brought a huge array of cakes, chocolate, sweets and materials to decorate cupcakes and cake pops in festive designs. The children were taught how to make reindeer, snowmen and polar bears using the sweets in ingenious ways, for example to create hats and eyes before having a go at each of the designs themselves. The children experienced piping with chocolate and buttercream icing and got to take at least four different creations home. We want to give our huge thanks to Mrs Wade and Mrs Maurice for their time and generosity providing all the ingredients and materials. They were fabulous teachers and we all learnt a lot (including the teachers who came to see the excitement). Look who visited us today! For the first time for many days, I see blue sky outside my office window hopefully a sign of better weather to come for the Festive Season. In school, the sky could be blue, grey or even black it would not matter as the children are sharing their own light as the excitement builds towards the greatest day. Our youngest children surpassed themselves in their depiction of the Nativity story this year. The skilful acting, speaking, singing and dancing belied their young ages and left no one in any doubt about the true message of Christmas. Our school Carol Service led by Years 3 and 4 was truly atmospheric and really rather special. The residents of Mills Meadow were also very appreciative of the festive cheer our Year 5 and Reception children spread as they sang a selection of Christmas songs. Our traditional Christmas dinner with decorated jumpers was made even more exciting by the appearance of Christmas crackers this year! We turned many a head and had shoppers pausing to listen as the children sang with enthusiasm and gusto at the local supermarket, carolling not just once, but twice. The list could go on and on with parties, Christmas films and the appearance of Father Christmas still to come. With stars and tinsel abounding it is marvellous that children continue to learn and are enthusiastic to share their learning. Although for everyone this is a frantic time of year, it is worth taking a moment to reflect on the past term or even year. To see the changes in our children, to see confidence grow, to recognise their achievements and to see learning progressing is wonderful. None of this could happen without the amazing staff team we are so fortunate to have at our school and our wonderful Governors, volunteers, Friends, Parent Councillors and parents. They all contribute in a variety of ways to ensure that every one of our children receives the very best opportunity to learn, to care and to inspire those around them. I would like to thank all those involved in our school family who work so hard for our children. I would especially like to thank Mrs Skevington who sadly leaves us on Friday as Year 3 class teacher. She has been a wonderful teacher and a supportive, caring colleague who will be greatly missed. She has, however, promised to remain a part of our school family so no doubt we will see her in school soon. We look forward to welcoming Mrs Hall as our Year 3 teacher in January. On a final note, I would like to say that it is clear to me that Sir Robert Hitcham’s is quite an exceptional school with quite remarkable children and I am very proud to say that I am the Headteacher. Our annual inter-house gala at Framlingham College was won this year by Bulstrode with Howard in second. Members of our orchestra are enjoying learning to play traditional carols which they will play in our last assembly this term. We have enjoyed experimenting with our new music stand lights too! You sang beautifully on Sunday. Despite there only being a few of you there - you were great. The church were really pleased that you all came and took part on the service with such eagerness and energy. If you're in Framlingham on Friday morning (11 December) then do pop into the Co-op at 10am to hear the children from class JA singing Christmas Carols. 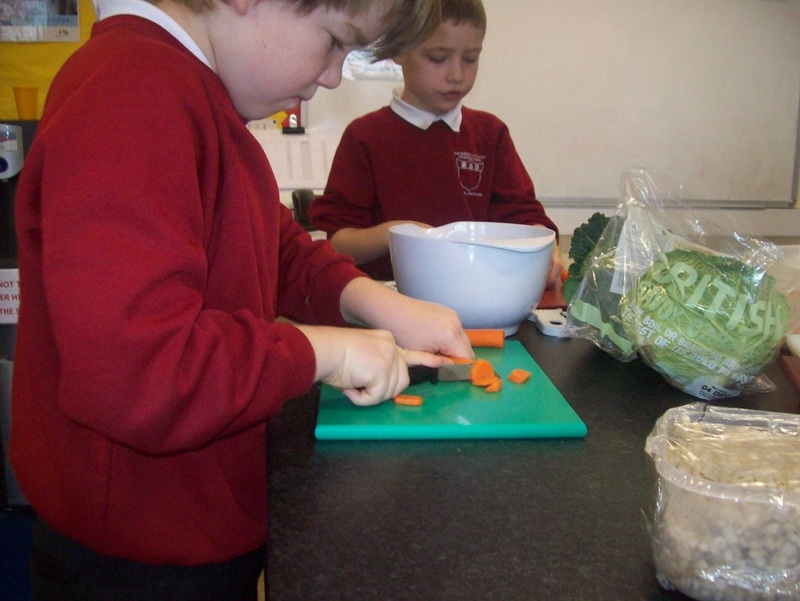 Last week class PL made an Anglo-Saxon pottage (or vegetable stew), by preparing vegetables, and adding authentic ingredients such as herbs, honey and barley. Most Anglo-Saxon families had simple meals of bread, porridge and vegetable stews; meat was only eaten on special occasions. Mr Byer's chess club is very popular this year. 40 children have entered the annual chess tournament. There will also be an inter-house team event after Christmas. 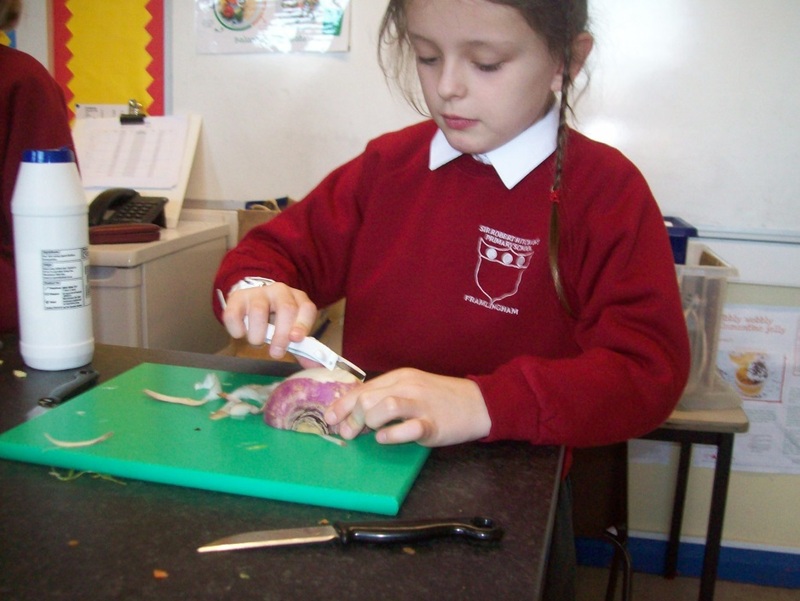 5 children from years 5 and 6 were presented with cookbooks as a reward for their superb cooking skills during our Hitcham's Head Chef competition which has been running throughout this term. Don't forget to buy your raffle tickets to stand a chance of winning one of these FABULOUS 13 CLASS CHRISTMAS HAMPERS. We have more books of Raffle Tickets in the Office. The draw takes places on Tuesday 15 December 2015.